Learn the 11 steps to creating an unstoppable lead-generation website. You don’t build a lead generation website for yourself. ...then it doesn’t matter if you like your website. Would you be happier with a beautiful website that sent you no business? Or a website you didn’t like the look of — but generated more customers and more revenue for your business? If you want your website to generate more business, you build your website for your customers. Not you. Of course, you want your website to look great — because a great looking website looks more professional, appealing, and earns trust. Aesthetics are a means to an end as a part of your business goals with your website. In this article, you’ll learn how to create an unstoppable lead-generation website. What’s a lead-generation website going to do for you? ...then you’ll need a lead-generation website. That’s what a lead-generation website does for you: generates new business 24/7 on autopilot. All without lifting a finger. In the 1990s, websites were designed for designers. In 2000, websites were designed for search engines. 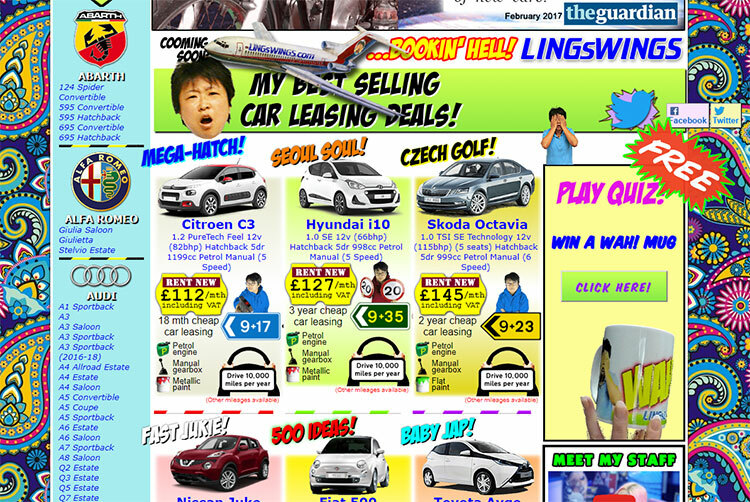 In 2010, websites were designed for companies. However, throughout that period, there were a small number of companies that didn’t follow those trends. These companies, the most successful websites, focus on their customers. If you’re a web designer, stop trying to please your clients with your design. This isn’t 2010. You’re designing a solution to a business problem. If you’re a business owner, ask yourself if you want your website built for you or your customers. You may want to make all the design decisions for your website. To hire a pair of hands to create your vision. All the power to you. This article is not for you. If you’re serious about creating a website that wins you new business, read on. So you’re serious about creating a lead-generation website. A website that’s better than your best salesperson. A website that works 24/7 — filling up your business pipeline like clockwork. If you’ve got your website builder open right now, go ahead and close that. You won’t need it yet. Before you can build a lead-generation website, you need to know your customer. I don’t mean surface-level details like their age, gender, and location. I mean getting to know them on a much deeper level. The best way to understand your customers is to pick one of your ideal customers. A customer that you’d like to replicate. A customer who wants what you’re selling. Then you understand what concerns most — if not all — of your customers. It’s much easier to write and build something for one person than a group. You’re an HVAC contractor. You want to build recurring revenue into your business. You offer maintenance agreements for homeowners. Your perfect customer is a stay-at-home mom named Reanne. Reanne’s frustrated by her A/C breaking down every few months in the summer. She has no clue about all this “HVAC stuff.” She wants to call someone in to fix it whenever it breaks. But she’s wary about hiring the first contractor that pops up. She wants someone who she trusts with her family’s home comfort. The last thing she wants is for someone to take advantage of her — and upsell her products she doesn’t need. Reanne wants the peace of mind knowing she has a reliable contractor on retainer. She wants the feeling of knowing that her home comfort is secure. These are Reanne’s problems, desires, and uncertainties. They are applicable to ALL customers who desire home comfort. Going through this process helps you understand your customer better than they know themselves. What’s the best way to learn this information? By talking to one of your ideal customers — and listening. Your customers will shock you with how much they’ll tell you. But you must stop selling for a moment — and listen! Email or call one of your ideal clients. They can be a prospective client or a current client. But they should be someone who you wish you could serve over and over. Ask them if they have 20 minutes to talk about themselves. Tell them you want to learn more about them and why they would use a service like yours. Offer them a discount coupon if they’re willing to help. During the conversation, ask them what they’re looking for in a service like yours. Listen to what they say. Take notes during the conversation. Use follow up questions like “why is that important to you?” and dig deeper. Continue to ask “why”...and they will tell you exactly what they want. A lead-generation website starts with your customer's needs. Not yours. Your service is more than just your service. We buy products and services to satisfy our inner desires. Services are a part of what get us there. ‍Survival, enjoyment of life, life extension. It doesn’t matter if you’re selling carpet cleaning, life insurance, or graffiti removal. You need to sell one of the “Life-Force 8” if you want to generate leads from your website. Customers aren’t buying your process. They are buying the outcome of your process. If you’re selling carpet cleaning, you’re not really selling carpet cleaning. You’re not selling them your truck-mounted steam cleaning equipment. You’re selling them more comfortable living conditions. You’re selling them the time and energy they save by hiring someone else to do it. You’re selling them the feeling of loving their home again. Carpet cleaning is an input. A cleaner, healthier home is an output. You should be selling outputs, not inputs. When you understand what you’re really selling, you start to tap into the desires of your customers. ...in the mind of your customer, clicking on that button should bring them one step closer to one of the Life-Force 8. Scroll back up and take a look a the Life-Force 8. Which of those 8 are you selling? Cleanliness of body and surroundings. Here’s an exercise that will help you connect your service to the Life-Force 8. List the most basic description of your service. Level 2: So your air ducts are free of dust and allergens. Level 3: So you can breathe in cleaner air. Level 4: So you can enjoy a healthier lifestyle and feel more relaxed at home. Notice how we go “deeper” with each level increase — until we arrive at one of those core desires. Use the “So what” test to go from the surface level service to what your customer wants to feel as a result of your service. That’s what you’re really selling. Tapping into these desires is critical to creating a powerful lead-generation website. It’s also important that you define what makes your company unique. If you’re in a crowded marketplace, you must find a way to “stick” in the mind of your customer. You do that by creating a uniqueness to your company. 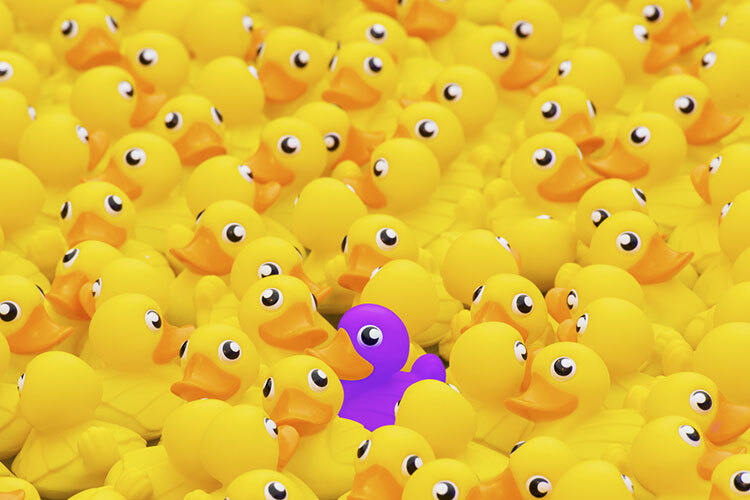 Your uniqueness makes you stand out in the crowd. What are all the ways your business is different from your competitors? Which of those reasons is the most important? What is the most important thing you do to improve the lives of your customers? This is your brand. It’s the promise your business makes to each customer. And it’s how people will remember you above the competition in your field. …you’ll need to collect the materials for your lead-generation website. Now you know your customers and you know your business. It’s time to start collecting the materials that make up a lead-generation website. Make sure you have a high-quality version of your logo against a white background. A PNG version works perfectly for your website. PNG images have a transparent background, making them more versatile for your site. If your logo looks like it’s from 1992, it’s going to make your business look outdated and unattractive. Check out Fiverr or 99Designs and hire a professional to refresh your logo. You’ve defined your uniqueness, so make sure your logo communicates it. The look of your logo defines the look of your website, so it pays to get that right. Do you feel like you can trust a company that uses obvious stock photos on their website? Me neither. Your customers want to see you, your team, your building, your service van, etc. These help build trust. And the higher the quality of your photos, the better. Using authentic, professional shots of you or your team will boost your conversion rate. They catch more attention, make you stand out, and show your customers who they’re working with. Your service exists to improve your customer’s life. On your website, you’ll communicate how you do that not only with words — but with photos as well. Photos allow you to show your customer how your service will improve their life. If you run a barbershop for men, take pictures of your best cuts. If you own a carpet cleaning business, take before and after pictures of your carpet cleaning projects. Effective photos tell a story. They show your customer how their life is without your service (now), and will be after your service. Make sure that your main subject is in focus and not blurry. This helps customers look at what you want them to look at — not other parts of your shot! To try and keep your shadow out of the photo. This removes distraction and makes for a more professional looking shot. Take your best shot! Don’t just snap a picture right before you leave -- take a couple of photos so you have some options to work with. The better your shot, the higher the chance it will turn a potential client into a customer. What awards have you won for your services? Which professional certificates have you earned? Often, the organizations that offer awards (Angie’s List, Housecall Pro) and certificates have badges you can show on your website. Using these badges provides a boost to your conversion rate. Even better if you tell your customer how you earned the badge, and why it matters for them. Again, use these badges to tell a story about your company. If you’ve been featured in your local newspaper or anywhere else in the press, collect these media mentions. Press features are another powerful differentiator for your business. Customer’s can’t help but think you’re better if you’re featured somewhere. Have you ever tried to eat at a restaurant that was featured on the news? It was hard to get a seat, wasn’t it? It touches on one of the most important elements of persuasion: social proof. If you have logos of recognizable clients, you should use these as well. Of course, make sure you ask for their permission. A combination of logos and features are powerful elements of persuasion. When you’re looking to purchase a service, do you trust what the company says about themselves? Or do you trust what their customers say? Your reviews are the cornerstone of your digital presence. 93% of your customers check your reviews to make a purchasing decision. And you’ll want to display your best reviews throughout your website. When you include multiple reviews on your website, you let your customers do the talking for you. More on this in a later step. It’s far more convincing than trying to convince a customer you’re the best all by yourself. NiceJob does that for you. Check it out if you don’t have an easy, automatic way of getting more reviews. Your lead-generation website will thank you! There are some customers who benefit from your service so much that they deserve to be a case study. Make this customer and their story a part of your company’s own story. Cap it off with a video testimonial from the client, and you’ll have a case study that wins you more business. A good case study draws your potential customers in. It puts them in the shoes of your featured customer. It helps them visualize life after using your service. The more of these materials you collect, the easier time you will have building your website. You’ll find winning new business from your website is much easier when you use these materials. How do we write in a way that turns traffic into customers? Copywriting is the answer. Copywriting is salesmanship — in print. It’s writing that persuades your customer to take action. Copywriting is what turns a “digital brochure” into a high-powered lead-generation machine. You’ll want to write your website’s copy before you get started on the design. Because you build your design to showcase your content. Not vice-versa. Choosing a template and then inserting the copy is a backward and less effective approach. Customers are coming to your site for the content. No one comes to a site because of the design. They come for the content or the service, like booking air travel. The design should encourage them to stay, offering a wonderfully easy-to-understand and even delightful way to interact with that content or service. Bad design can certainly bury good content, but you can’t design a “premium experience” and pour crap content into it with any expectation of success. If you want to create a lead-generation website, your website’s primary content is its copy. In this section, we’re going to cover what you should be writing — and how. What should you write if you want copy that sells? The Brain Audit by Sean D’Souza contains a powerful metaphor — the conveyor belt and the 7 red bags. Each of your customers is like a traveler at an airport. They’ve gotten off their plane. Now, they are at baggage claims, waiting for their 7 red bags. They won’t leave the airport until they have all 7 of their bags. Those “7 red bags” are what your customers must know before they’re ready to buy. You can structure your copy after these 7 red bags. Give your customers the right bag at the right time. Now, you know your customer better than they know themselves. Filling out these prompts and writing your copy will be easier. What problem is your customer facing? You lead with the problem, because the problem is more attention grabbing. Draw them in by describing their problem. Dig into the pain they are feeling. What do you offer that solves this problem? You follow up with the solution(s). You’re showing your client that you have the “antidote” to their pain. Who’s your ideal customer: one who is facing the problem and desires your solution? Like we discussed in step 3, this is the one person who you’re writing for. Customers are more likely to buy when they feel as though you understand them. Show them you understand their desires, frustrations, and uncertainties. Also known as your “Unique Selling Proposition" or “USP.” This is a simple statement that tells the customer what you do. If you run a maid service for homeowners who don’t have time to clean, yours could be: “Our cleaning services help busy homeowners save time.” Simple, memorable, effective. What are your most common objections? Objections are good — they are a sign of interest. You overcome objections in your copy by writing them in your copy. Show your customer that you understand their objections. Which of your testimonials answer said objections? It’s great if you can overcome objections yourself. But your potential customers want to hear from your existing customers. Use specific testimonials to overcome specific objections. What type of guarantee do you offer? Customers dislike risk when buying. A guarantee removes this feeling of risk, making it easier for them to buy. Make your guarantee memorable and unique. What’s the one thing you want to achieve for your customer? If there’s nothing about you that stands out, they’ll check out your competitor next. This last bag, covered in the previous section, is what makes you stand out. It’s the one big promise your business makes to your customer. If you structure your copy after these “7 red bags”, you’re well on your way to lead-generating copy. Effective copy is like having a sales conversation with your buyer. If you can sell your service, you can write good copy. Use a tool like Hemingway App when writing your copy. It keeps your writing clean and conversational. The more readable your copy is, the more likely your customers are to read it. Open up Hemingway App. List the 7 red bags as headers. Use this section and write your copy using the 7 bags as your guidelines. Voilà — you've completed one of the most difficult parts of your lead-generation website! Now, let’s learn about one of the most critical aspects of your lead-generation website — your reviews. What’s the first thing you do before you hire a business for their service? If you’re like most people, you check out their reviews. Reviews are a critical piece of your marketing puzzle. Why are they so important? Think about why you read them. A business can say anything they want about themselves. They can tell you that they are the fastest, cheapest, and best quality in town. But unless you hear that from their customers, it’s much harder to believe them. Reviews are a form of social proof. They build trust. And you’ll be using them throughout your website to make it more persuasive. An effective review tells a story. It puts your prospective customer in the shoes of your reviewing customer. It takes them on a journey, showing them life before your service, how you helped, and life after your service. Aaron came out on Weds last week to evaluate my 21 year old heater. He arrived right on time. He gave me the quotes for the parts that needed replaced, and did not push me to buy a new unit. My husband & I decided on a new unit, as the parts were $900 shy of a new unit, and heaters only last 20-30 years on average. Aaron got it in lickety-split yesterday, only 1 week later, just as the colder nights are to set in! He explained everything very well in layman’s terms, and it was easy to see he wasn’t trying to pull any wool over my eyes, especially being a person with zero heater knowledge. I greatly appreciate this business, and I would recommend them HIGHLY to anyone in need of heating repairs! Reviews don’t get much better than this. If you’re a homeowner looking for heater repairs and you read this review, you’re sold. If you identify with any of the statements within the review, you identify with the review author. You're able to feel what that customer was feeling. It touches on your desires, frustrations, and uncertainties. The review itself (from your neighbor) answers the objections — not the company. That’s what make them so powerful. Now, this doesn’t mean all your reviews must be 120+ word stories. Once you’ve listed your common objections, feature reviews that answer each objection. If you don’t have reviews to answer your common objections, here’s how you get them. Don’t send this to all your customers — send it only to the ones who loved your service the most. They’ll give you a review so powerful that it deserves a spot on your website’s homepage. 90% of consumers think reviews are more important than what salespeople say. Sprinkle reviews throughout your website. Use them to answer objections. Use video testimonials. Use case studies. Tell your customer’s stories. 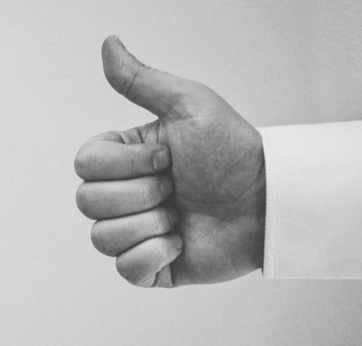 Most service companies don’t use enough social proof. From a conversion standpoint, you're better off overdoing it than underdoing it. If you don’t have the time to send manual invites and remind your customers, our reviews product will do this for you. We make it easy for you to get more reviews on autopilot. This saves you time and money. And it helps you gather persuasive content for your lead-generation website. Create a list of your most common objections. Whenever you hear a common objection, insert that in the spreadsheet. Whenever you collect a review that answers an objection, add that to your spreadsheet. Listing all your objections and reviews for each objection is the “icing on the cake” for your lead-generation website! Now, you’re ready to dive in and start building your lead-generation website. You can’t create a lead-generation website without these 5 steps. Now that you have everything, laying out your lead-generation website will be a cinch. Think of your website layout as a series of blocks. Each block — or module — provides information to your customer. They need this information before they will make a purchasing decision. Remember — you’re creating a layout that gives them what they want, when they want it. The modularization should reflect the visitor’s mental model—not the mental model of the website’s creator. Navbar: This is your website’s navigation — also known as a “header” or “menu.” The purpose of your navbar is to help your customer find what they are looking for. Don’t reinvent the wheel with your navbar — keep it clean, simple, and contemporary. Include your phone number and “Book Online” or “Free Estimate” (your “calls-to-actions” — or “CTAs”) button in your navbar. Some customers want to book your service right away. Give them that opportunity with your navbar. ‍Hero: This is the topmost section of your website. This section should help your customer understand what it is that you do. They should be able to figure it out in less than 5 seconds. Anything longer, and you’re providing a poor user experience. A short and simple USP with a picture of your team makes up a great hero section. Your goal with this section is to get them to scroll down and read more. ‍Intro: Right underneath your hero section comes an intro section. Most companies go straight into talking about themselves. Your customer doesn’t care yet. It’s fine to talk about your company — but frame it in a way that makes it about their lives. Your intro is a great place to bring up the “problem” bag and draw them into your copy. Include a grid of your services so that your customer can find the service that’s most relevant to them. Draw attention to your CTAs in this section. You can also introduce some social proof, such as badges, certificates, etc. Footer: Your website’s bottom-most section is called the footer. This is where you make it easy for your customer to contact you. The goal of your footer is to answer all the logistical questions your customer might have. With your footer, you tell the customer where you work, when you work, your address, email, phone number, and a Google Map. Like most of the other blocks, you’ll also include your CTAs. You’ll use each of these blocks on your website’s homepage — and other pages as well. Each one has a specific purpose. And each one is a part of what you need to convince the customer your service is the answer to their problem. Sketch a layout of your lead-generation website design. Stack these blocks on top of one another. Let’s say you’re an HVAC contractor who provides heating, cooling, and indoor air quality services. When sketching out your website’s layout, keep it simple. Get something on paper so you have a visual reference when you’re building it on your computer. Once that’s done, bring up your website builder. Create and organize the sections on your website. You already have most of the content ready from the previous steps. What does my customer want to learn about here? Which blocks can I use to further their understanding… and bring them closer to contacting us? These blocks are the building block of a lead-generation website. Fill them up with persuasive copy and you’re well on your way to a lead-generation machine. Think about companies that you’re loyal too. The ones that you identify with. You see their logo, coloring, typography — it feels as though this brand is for you. Their brand makes a promise to you — a promise that you’ve bought into. Try this: picture the person who shops at each of these stores. Everything about these brands — their colors, typography — are crafted to appeal to a particular type of customer. The type of customer that they want. The most powerful brands are exclusive. They turn people away. That draws their target in even more. Can you see someone who shops at Louis Vuitton shopping at Harley Davidson? No. Their brand is a story that creates a feeling. You want to create this sort of feeling when customers interact with your brand. This includes your website. You want to appeal to your ideal customer with something that they identify with. This is where your uniqueness gets to shine. Think about your business as one of the 12 brand archetypes. These archetypes are models of behaviour. Harley Davidson personifies The Outlaw. 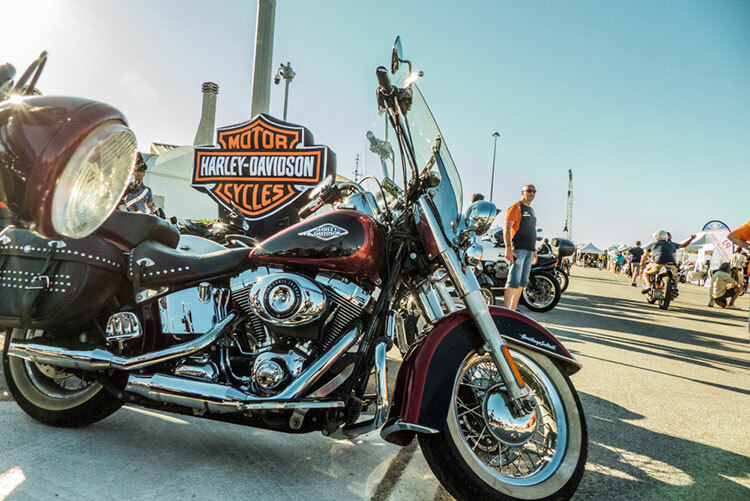 When you pictured someone shopping at Harley Davidson, you pictured a tough, muscular man. He’s buying more than just a motorcycle — he’s buying a sense of rebelliousness. The Outlaw appeals to him. Victoria’s Secret personifies The Lover. 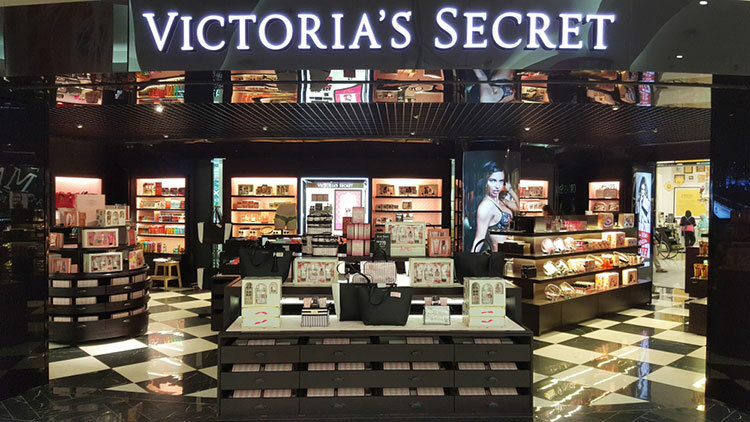 When you pictured someone shopping at Victoria’s secret, you pictured an attractive young woman. She’s buying more than just their products — she’s buying into sensuality. The Lover appeals to her. 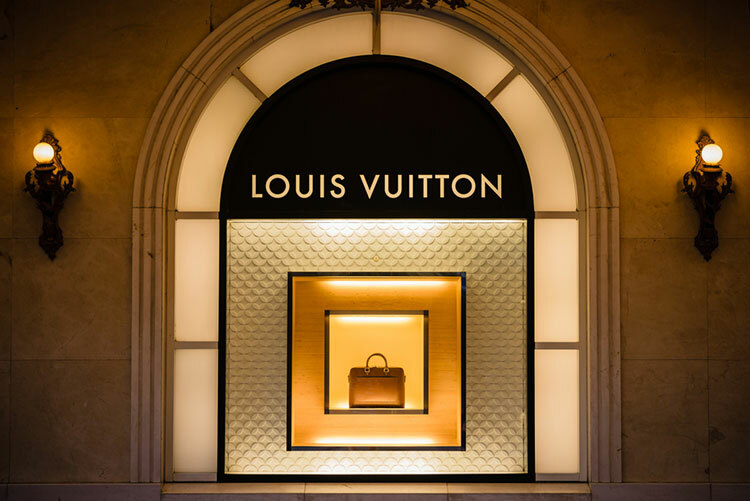 Louis Vuitton personifies The Ruler. When you pictured someone shopping at Louis Vuitton, you pictured someone who wants to show off their status. They’re buying more than just jewelry — they’re buying into exclusivity. The Ruler appeals to them. Which archetype should your business personify? Think about which of these archetypes appeals to your target profile. Are they looking for someone to take care of them — a sense of security knowing you’ll be there for them? Your brand archetype is the Caregiver. Are they looking for an expert — knowing that they are working with an expert than can answer all their questions? Your brand archetype is the Sage. Are they looking for someone relatable — a company who feels like extended family and who comes with predictability? Your brand archetype is the Caregiver. Once you’ve chosen your brand archetype, choosing things like your website’s typography, color palette, and graphics are easier. … but if your target profile doesn’t feel your uniqueness, you’re missing out on your best leads. The best lead-generation websites combine lead-generation principles with meticulous branding. First, choose your brand archetype from the list of 12. Think about which one of those appeals to your target profile. Second, choose your website’s typography, the fonts you use on your site. It should be fitting with your logo. Third, choose your website's color palette. Make it consistent with your other marketing material. Finally, apply this to your website. Your website has gone from “lifeless” to having character. It’s beginning to embody your brand archetype. Your website is an extension of your brand. When a customer interacts with your business, they should feel your brand. Just like when they visit your website. This creates a consistent, professional customer experience. And it’s a powerful conversion booster. You’ve written, laid out, and have started to build your website. If you’re like most people, your website is starting to look a little crammed. Your goal is to generate leads. Your customer’s goal is to solve their problem. Aligning these two goals is what you want to achieve with your website. What do you see first when you visit your website? How easy is it for your customers to find what they want? What on the website stands in the way of your customer’s ability to find what they want? When you’re examining your website through the eyes of your customer, you want to pretend that you’re lazy, tired, and short on time. If your website is easy to use when your customer is lazy, tired, and short on time, then you know your website is user-friendly. It provides a good user experience. What makes your lead-generation website user-friendly? First, you want to make sure your customer knows where to look. 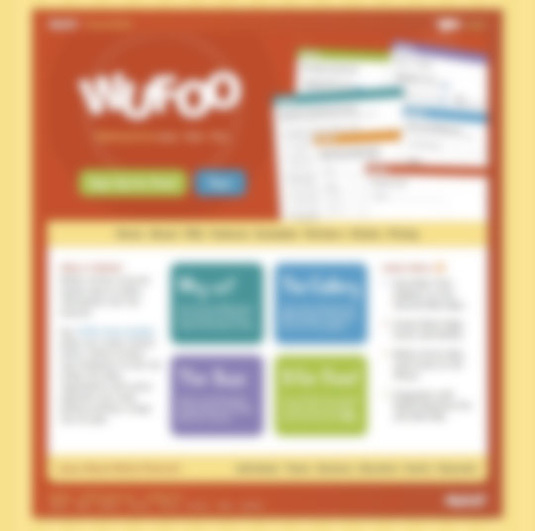 You can test for your website’s visual hierarchy by using the blur test. Save a screenshot of your website using a tool like Full Page Screen Capture. Then, open it up in your photo editor. Apply a 5-10 pixel Gaussian Blur. Doing this strips your website down to it’s visual hierarchy. Your website’s visual hierarchy is the hierarchy of importance. It' determines how you arrange and design the elements on your website. Now that you can’t read your website and can only see it’s visual components. What does your customer want to notice first? You want to make sure that your website is scannable. Your CTAs, USP, section headers, and benefits should draw the most attention. These make your website scannable. It gives the customer frequent opportunities to call you for your service and solve their problem. An effective visual hierarchy helps your customers understand where they should be looking. It gives their eyes a path through your website. There are so many elements on the website that you don’t know where to look. You don’t know where or what you should click, either. Making something bigger or changing its color is one way to emphasize elements. You should be doing this with your CTAs, header, USPs, and other important elements of your website. But the best way to improve your visual hierarchy is to remove elements that don’t need to be there. The more crap I remove from a website the more likely a user sees the thing the client needs them to. The clearer our path to the goal, the more likely we are to reach it. Like good writing — conversion-focused design is about cutting out the fat. Creating a lead-generation website isn’t about dumping as many images, badges, and reviews as possible. That can be counter intuitive if you overdo it. Improve your website’s conversion rate by taking elements away — not adding more. What can you remove from your website that doesn’t help your customer? Apply the law of 80/20 of your website. 20% of your website is going to generate 80% of what your customer’s want to see. Your ability to put that 20% at the top of your visual hierarchy is critical to your website’s success. It’s no secret that your CTA’s are a big part of that 20%. The more of your visitors who call you or fill out your lead form, the more customers you’ll have. Before your customers can click on your “call now” button, they have to notice it. Using contrast will make them stand out — and draw your customers eyes toward them. To maximize the persuasiveness of your CTA’s, write microcopy. In the context of your lead-generation website, that’s the copy on your buttons. Have you ever seen a button that read “submit” or “subscribe”? Those words don’t do anything to persuade me towards clicking on them. I’m going to click it. Do the same for your buttons. Use the copy on your buttons to show your customer that you’ll solve their problem. Everything on your website should be easy to use — and it should focus on converting your customer into a lead. Make it a great experience for them, and they’re that much closer to purchasing. Re-examine your website through the eyes of your customer. Apply the blur test to get a sense of your website’s visual hierarchy. Remove distractions from your website. Use contrast to draw attention to your calls-to-actions. Write microcopy for your CTAs and anything you want customers to interact with. Now, we’re getting close to going live. But first, let’s make sure your website follows the same principles on other devices. So you’ve designed your lead-generation website on your computer…but how does it look on your phone? In 2019, most of the customers who visit your website will visit your website via their phone. And they could be using Chrome, Safari, or another one of many internet browsers. For your website to generate leads, it must do so on all devices and all browsers. That means you must build it so that it’s adaptive to your customer’s phone, computer, tablet — whatever they use. Keeping your conversion rate high on a mobile device is a challenge. You don’t have as much space to work with. But as we covered in the last step, optimizing your website for mobile is an exercise in removing (or hiding) the unnecessary. You’ll do an extra round of 80/20 analysis when editing your website for tablets and phones. Again, put yourself in the shoes of your customer. You’re an appliance repair company, and your customer is a homeowner who’s dishwasher has broken. She takes out her iPhone 8, googles “appliance repair near me” and lands on your website. She’s frustrated, tired, and not very tech-savvy. She doesn’t want to read a long service description — she wants someone to come and fix it for her. Now. If your customer is in this state of mind, how does your website fare? You’ll likely have to make some tweaks to it to make sure that it provides a user-friendly mobile experience. Make sure your customer doesn’t have to scroll horizontally. This a time-consuming task for your customer that provides them with a terrible experience. Not the right start if you want to win their business. Your customer should be able to scroll down and see all of your services, the primary benefits, and most importantly — buttons to contact you for help. Customers prefer scrolling on their phones and tablets. Make sure your website loads quickly. Your customers expect it. Assume every one of them is impatient. Give them a loading time of 3 seconds or less. Use a tool like Google Pagespeed Insights or GTmetrix to find out how long it takes your website to load. You’ll also learn how to optimize them for increased speeds. Make sure you aren’t using any desktop-only features on your site. Mobile user’s can't hover. Tabs and accordions (text boxes that open up when clicked) provide a clumsy experience. Opt for the mobile-first approach. Build for your mobile users first, and then scale up to tablet and desktop. Make sure your website navigation is easy to use. Your customer should not have to click a bunch of menu buttons to find what they need. They want to scroll and find what they want quickly. Or they want to tap on an image/icon that demonstrates what they are looking for. A “sticky” navigation (navigation that scrolls with the user) is helpful on mobile. It provides access to all your pages while customers scroll. Make sure your CTAs are seamless. Ensure they can call you with a tap of their finger no matter where they are on your site. Your lead form should be 3-4 fields at most. Nobody wants to fill out a 12 field form on their phone. Your contact information and address should be quick to find on mobile devices. Once you’ve implemented the above tips, use your website on the other major browsers. You don’t want an important feature failing due to a browser-related technical issue. This can tank your conversion rate without you even knowing it until you’ve missed out on business. If your website works well on all devices and browsers, it has lead-generation power no matter how your customer finds your site. When you launch your website, you’ll monitor your conversion rate based on device. The higher (and closer) you can keep your conversion rate, the more consistent your website experience is. Bring up your website on your mobile phone. Put yourself in the shoes of our customer — but this time, you’re on the go. You’re even shorter on time. If your website doesn’t provide a great mobile experience, implement the above tips on your website. You don’t have a true lead-generation website if it only converts on desktop. If you’ve followed the steps in this article, you’ve primed your website for lead-generation magic. Don’t hit the publish button just yet! If you haven’t had a second pair of eyes on your website, you’re missing one of the most critical steps — the peer review. Before you go live with your website, it’s essential that someone reviews your website. Another person will spot grammar or responsiveness issues. They’ll also critique your design decisions. They’ll ask you to explain your reasoning. “Why didn’t you include the CTA’s there? By doing this, they force you into critical thinking. Each of your design decisions should have a strong reasoning behind it. If you’ve hired a designer to build your website, ask them the “why” behind their decisions. If they don’t give you a well-thought answer, you’re not working with an experienced designer. One way to make sure you don’t miss anything on your website is to use a checklist. Checklists are a proven way to make sure you don’t skip key steps. Ensure that the link attached to your phone number is the right number. Ensure that the link attached to your email address is the right address. Ensure that your website displays correctly on all devices and browsers. You can use a tool like BrowserStack to test your website on all displays and browsers. Ensure that your calls-to-actions contrast your primary colors and draw attention. Ensure that there are no broken links on your website. You can use a tool like Screaming Frog to spot broken links. Ensure that there are no spelling or grammar mistakes on your website. You can use a tool like Grammarly to spot and correct grammar issues. Ensure that your copy is large enough for easy reading and contrasts against the background. This is important if your typical customer is older. You can use a tool like Contrast Ratio to make sure there is enough contrast. Ensure that your copy is easy to understand. If you cannot explain your service writing at a grade 3-6 level, you have no described it well enough. There is no need for your copy to be any more complicated than a grade 6 reading level. Your customers don’t have time or energy to read anything more complicated. Ensure that your website is modeled for your customers. Don’t start off by telling them about your company. Lead them through the “7 red bags” — laying out your website in a way that answers their questions one by one. Ensure that your website has Google Analytics installed! You don’t have a lead-generation website if you don’t have the data. This checklist focuses on conversion aspects. There are many other things related to your website that you should have checked off. You can find checklist for non-conversion related items here. A peer review is a fantastic way to spot and fix errors on your website. But the real insights come from watching a potential customer use your website. This is user-testing. And the information you’ll gain from user-testing are worth their weight in gold. A user test (or usability test) involves observing someone using your website and noting any issues that arise. User testing is not rocket science—in fact, it’s mundane—but it’s perhaps the most powerful technique in this book. Considering offering one of your clients (who wouldn’t be afraid to tell you the blunt, honest truth) a free service if you can watch them use your site. User testing helps you improve your website’s conversion rate based on your customer’s feedback. Run your website through this checklist. Then, pick someone to go through the same checklist to spot anything else you missed out on. Lastly pick one of your least-tech savvy customers (who’s also the most blunt), and ask them to perform specific tasks on your website. Write down any challenges you observe and any other insights from this session. After these three tasks, you’re finally ready to launch! Go ahead and hit the publish button on your website. Start driving traffic towards it. Watch how it performs. You’re not done yet… you’ve just begun. This is when the fun begins. Now’s the beginning of your lead-generation website. Since you’re measuring the performance of your website, you can improve it. I don’t mean by doing a re-design to follow new design trends every few years. I mean making frequent, bold, data-driven decisions. Now that your lead-generation is live, you’ll get more than new customers — you’ll get actionable feedback and data. It’s rare that your website will be perfect on launch. Instead of making changes based on feelings, you’ll make them based on what your customers tell you. And the more you improve your website's conversion rate, the more customers you’ll have. That means more money to spend on marketing — and get even more customers. You’ll create a cash-machine in your lead-generation website. This is the approach you follow to optimize your website’s conversion rate. Make frequent, targeted improvements to specific elements on your website. These will compound over time, making your lead-generation website unstoppable. Bookmark your website’s Google Analytics and review it often. Create a dashboard that shows you essential statistics. If you followed the steps in this guide, then your website will be converting higher than average. NiceJob: Stories and reviews widgets for trusted social proof and demonstrating your work.You'll be able to instantly publish photos of your work and reviews on your website. HotJar: Screen recordings of users using your website. A fantastic tool for showing you how customers use your website. You’ll see their clicks, scrolling patterns — everything you need to identify barriers to conversion. Drift: A free live chat platform that fits right into your website. With Drift, your customers can visit your website and chat with you or someone on your team in real time. MailChimp: Free, easy to use email marketing software. Helps you capture leads and bring them back to your website with permission-based marketing. Mailchimp gives you audience data to help you market to the right customers at the right time. Optimizely: A/B testing software. Optimizely helps you create two versions of a webpage so you can let your ideas battle it out in the field. You’ll never wonder which idea works better — you’ll just test it! UserTesting: With UserTesting.com, you can get all of your user testing done online. Their platform makes it easy for you to gather insights and make improvements. That’s plenty to keep you busy with over the next few months. But remember this: crafting the perfect lead-generation website is an endless journey. Web design trends are always changing. There’s always going to be a shiny new tool for you to try. There’s always going to be a new website building platform. We all have desires, frustrations, and uncertainties. We crave solutions that will help solve our problems and help us live more comfortable lives. Use your website and show your customer’s that it’s your service that solves their problem. Do that well, and your website will always be a lead-generation website. True charisma comes from being a great listener. Make your website charismatic. Show your customers that you understand them — and they’ll reward you with new business. After your website has been live for 90 days, take a look at your Google Analytics. Think about what you’ve learned over these past 90 days. How can you improve your headline? How can you make your guarantee better? What can you remove to make your CTAs stand out more? Make a targeted change on your website. Measure the results in Google Analytics. ...and do this the rest of your years in business! Feeling Overwhelmed? Convert Is For You! … and how to combine what you’ve learned into creating your own lead-generation website. 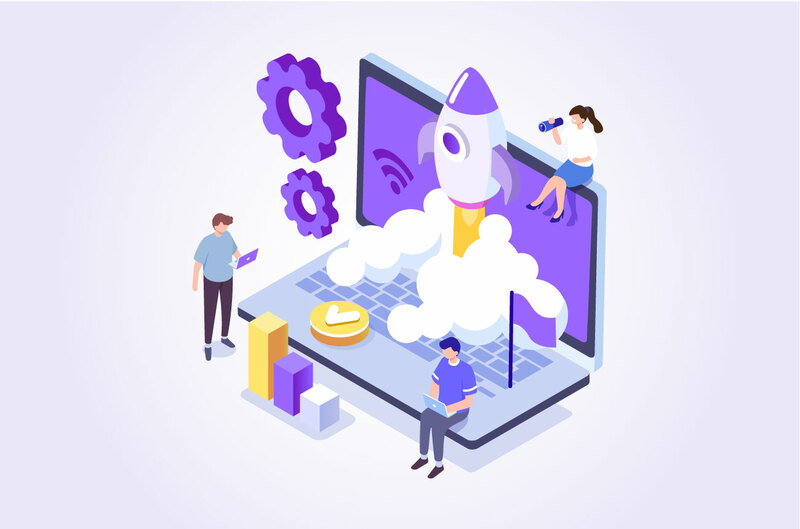 For those of you with a lot of time on your hands, bookmark this guide and use it build your lead-generation website. … we designed Convert, our website product, just for you. We’ll take you through these 11 steps and build your lead-generation website. And we’ll have it ready for you in 2 weeks max. We stand by our process. We GUARANTEE that your website will convert 10% higher than your current website. Most of our clients see a 15-20% higher conversion rate — more than double their industry average. If it doesn't — you don’t pay. It’s impossible for you to lose money with Convert. What would an extra 15-20% of revenue do for your business? If you’d like to learn more about Convert, check out our Convert page and learn the details. Or, you can book a call with one of our Success team members to learn more. If your competitors aren’t focusing on CRO already, they will be soon, because the market will keep getting more competitive. Every day you’re ahead, you have an unfair advantage—the wind is in your sails. Every day you are behind, you have an unfair disadvantage—you’re playing catch-up. Don’t let your website (and your business) fall behind. Check out Convert now — and claim your unfair advantage in your marketplace.